A child in Saitama Prefecture using an atypical elementary school backpack has spiralled into experimenting with recreational drugs. The Takahashi family became concerned when their son, Yuji, asked for a nonstandard elementary school backpack for his birthday late last year. 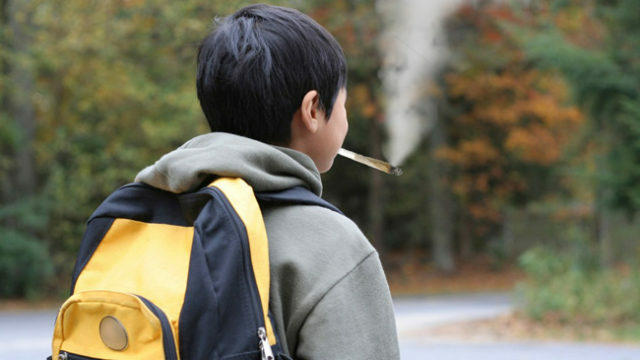 “I caught my little Yuji smoking a spliff the week after he began wearing the backpack,” said Mrs. Takahashi. Yuji’s parents say their son has recently been showing signs of abnormal creativity and critical thinking skills. “He’s now starting to develop reflective scepticism and challenging underlying assumptions,” said Mr. Takahashi. Yuji’s school has warned of unruly behaviour saying Yuji often rejects standardized formats of problem solving. “He’s even asking questions beginning with the word ‘why’,” said Yuji’s homeroom teacher. The Takahashi family is now attempting to ween Yuji back onto his old ‘randoseru’ before the situation escalates completing of control.